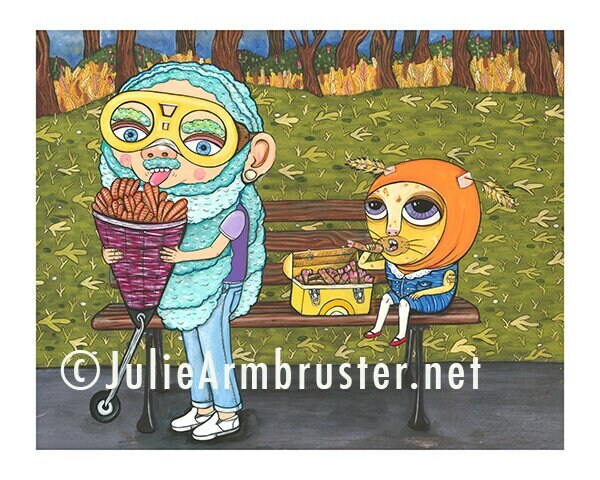 This image features two fashion forward guys munching away on their homemade vegetarian legs. The left fellow, Euclid, has a special wheeled, conical veggie leg holder. The telescoping handle is currently tucked in, but proves to be a fantastic advance in lunch box technology. Dusted with salt and lemon pepper the air crisped seitan strips were molded into bird toes. This happens to be the perfect for a guy obsessed with texture. On the right is Rodger. He nips at a more traditional veggie leg made with compressed soy nuggets molded into the shape of mini-deer legs and seasoned with a succulent umame glaze. He has recently joined the Fairybanks Feather Patrol and proudly wears two Fairybanks styled feather ears.